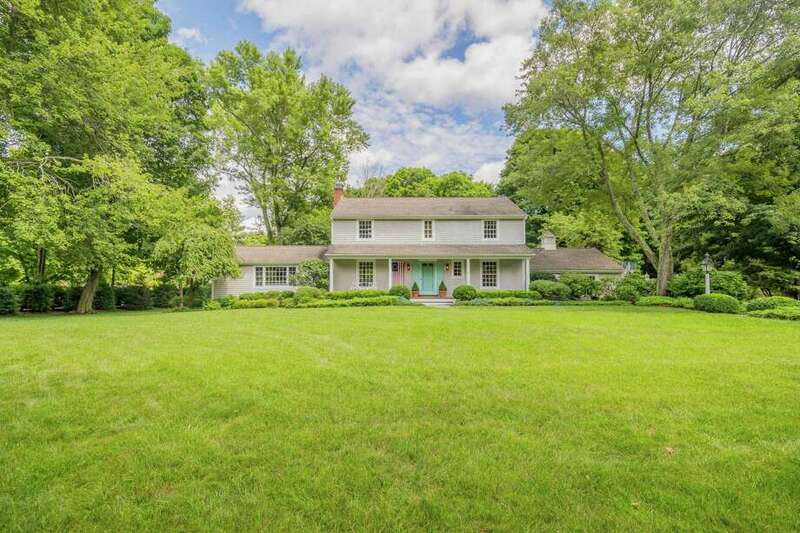 The quintessential New England colonial house at 1 Barry Lane sits on a cul-de-sac on a level property of one acre. WESTPORT — Lillian August launched a modest crafts and patchwork quilting business at her kitchen table in Fairfield County back in the 1980s and elevated it to a furniture, home furnishings, and interior design empire with showrooms and studios in Connecticut, New York and North Carolina. Emmy Award-nominated television host of Life on Mar’s: The Home Makeover Show, best-selling author, design expert, and realtor Mar Jennings took a modest colonial house at 1 Barry Lane and elevated it to a show-stopping show house through the use of strategic applications of trending paint colors and professional staging with selected items from Lillian August’s collections. Jennings and August entered into the collaborative partnership last spring with Jennings saying August’s creations dovetail beautifully into his signature design style, Casual Luxury. The gray house on Barry Lane is one of the select homes that he will stage with Lillian August services, “helping to elevate the marketing of homes, as both Mar and the Lillian August team create lifestyle vignettes that tell a story to the buyers, thus capturing both their love for the home—as well as love for the furnishings,” his press release read in part. “As a design influencer, Mar’s design style and global multi-media and social media platforms makes for a cohesive and natural partnership for us,” said Dan Weiss, president of Lillian August. “As a family business, we thrive on aligning ourselves with talented resources and community leaders within our market share. Mar’s commitment to us over the decades was the natural platform for growth and development,” Weiss said. The 2,978-square-foot gray house, which Jennings has dubbed Lantern Landing, sits on a cul-de-sac in the Red Coat section of Westport on a one-acre level property. This quintessential New England home was built in 1962 and throughout the years has received many improvements and updates that make it worthy of today’s lifestyle. Among its improvements are the replacement of all the windows and the 30-year architectural roof in 2002, the addition of central air conditioning, the expansion of the patio in the backyard and the addition of a stone wall, and the installation of invisible pet fencing along the perimeter of the property. In 2009 the boiler and hot water tank were replaced with a multi-zone Buderus boiler and domestic hot water system with an energy-saver Logamatic controller. And last year the oil tank was replaced with a state-of-the-art, double-lined Roth oil tank with a 30-year warranty. Antique verdigris lanterns stand in front of this eight-room house, on the fieldstone wall at the driveway entrance and on the lawn. They light the way to the ample crushed stone driveway lined in Belgium block, the attached two-car garage topped with a cupola, and the slate path to the covered front porch. The door opens into the attractive foyer where the first of the Lillian August furnishings are beautifully staged. Inside this charming, meticulously maintained home the formal living room has a fireplace and a bay/bow window, and there is chair railing in the formal dining room. The spacious family room features built-in bookshelves and cabinetry, a window seat, an exposed beam ceiling, paneled walls, and a built-in desk area. There are sliding doors to the large slate patio and backyard. In the gourmet kitchen there is a wide-plank reclaimed oak floor, custom cabinetry, granite counters, a breakfast nook, built-in hutch, and high-end appliances, including a gas range. On the second floor there are four bedrooms. The master suite has a walk-in closet with organizers and a private bath. There is new carpeting in the light-filled full finished lower-level, which can provide a flexible space for a bonus room or storage. Outside, Lantern Landing features attractive landscaping complete with window boxes, trellises, and a garden shed; all ready to inspire any gardener, beginner or expert. For more information or to set up an appointment to see the house, contact Mar Jennings and Karen Varsano of Douglas Elliman of Connecticut; Jennings at 203-227-4065 or mar@marjennings.com, and Varsano at 203-571-7303 or karen@marjennings.com.